Tell us a little about your path so far— where are you from? Where are you currently? Share a few career highlights. “In 2016 I moved four times. I’ve moved around a lot, but I’m currently settled in Joshua Tree CA. If you haven’t heard of it, it’s a beautiful desert town next to the Joshua Tree State Park. It sort of looks like an alien or post apocalyptic landscape full of huge boulder formations. At one point it used to be underwater, and I think about that a lot. How would you describe your personality? “My deepest trait is dedication to my craft. I hold a high importance on working and putting energy into my art practice. As I have matured the focus has grown even more. It’s made me slightly less playful than I have felt in the past. What does being an ‘entrepreneur’ mean to you? “First, being an entrepreneur is very different for female identified people than it is for men. Because it wasn't until recently that women have the access to that type of success. Therefore as a woman, my business is about being empowered in my success. The first question people ask me when I tell them what I do for a living is “And you make money doing that?" It links back to a deep patriarchal thinking that women can’t be successful. And even though I’d like to say something sarcastic in return to that very common insult I often receive, I try to have compassion for the way our world is changing and that not everyone has wrapped their mind around these ideas yet. In entrepreneurship, it’s about how you choose to create your reality and having full autonomy in that." Who was the last person that inspired you and why? “My friend and artist Shari Elf has inspired me so much. She uses recycled clothing to then transform into new pieces by adding patches, crochet, and, screen prints. She also makes fine art pieces from recycled materials. I admire the way she accounts for the destructive nature of the textile industry in her business model. What is the biggest lesson you learned in your 20s? “When I was in my early 20s, as many do, I struggled with knowing my direction. Looking back, I didn’t need one then. I was exploring, making mistakes, and figuring out what worked for me. I have A LOT of fun. I was a happy smelly mess and I loved it. I published my first tarot deck when I was 24. This was also the age that I stopped drinking alcohol, which changed my habits and priorities. Age 27 now, I have spent the last four years building a business and developing 5 decks with a 6th one on the way. What is your favorite Instagram to follow? Favorite brands on social? “Oh so many! It would be impossible to list them all! But I will say a few. I absolutely love Serpent and Bow @serpentandbow. 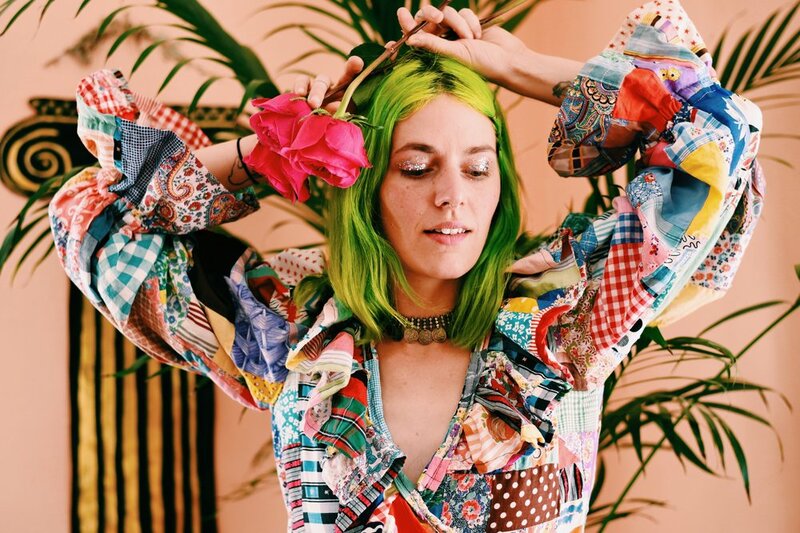 Rachel Blodgett creates undergarments with love and intention. She shares words of wisdom, and her own vulnerability. It’s a business practice I can really get behind. Solee Darrell @soleedarrelljewelry always makes the most beautiful sterling silver rings, necklaces, and, earrings. In her custom creations she uses what the client is personally trying to manifest as inspiration for her work. I have 2 of her rings and I just want more! I really admire businesses like Solee’s where each item is tailor made with so much thought. Lise Silva @lisesilva who is a collaborator on our collective project @inthehouseoflovers has always been such a joy and inspiration for me. I love to see everything that comes from her brilliant magical brain.